in the Fellowship Hall of Shady Grove Presbyterian Church, 5530 Shady Grove Road, Memphis, TN. Youth and adult visitors are always welcome at MAGS meetings. CLICK HERE FOR A LOCATION MAP. Click here for information on how you can become a MAGS member. We have monthly programs for both adults and youth. Check the calendar above for dates and program information. IMPORTANT NOTE: Non-members are not permited to participate in any MAGS field trips. This includes all areas: public, private collecting, and pay sites. No exceptions. 03.04.2019: MATTHEW LYBANON: During the March adult program, Mike Howrd will cover the geology, istory of discovery and exploration, unusual facts about the diamonds, things to see in the Park, how to hunt for diamonds, and more. 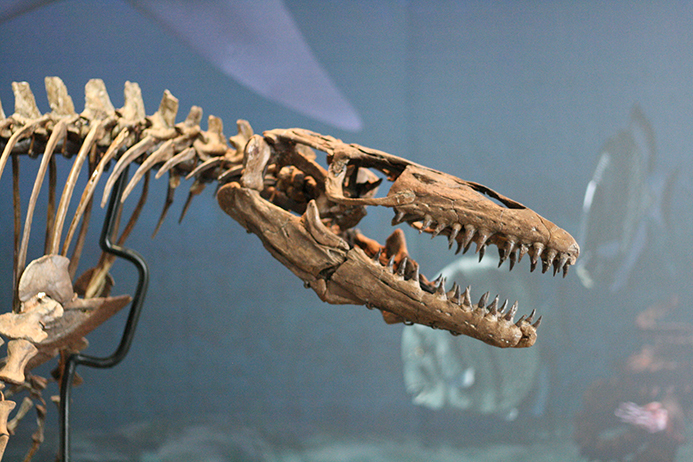 Jane Coop will present the March youth program on "What Are Fossils and How Are They Made?" Read more about MAGS activities and interests in the March issue of Rockhound News. 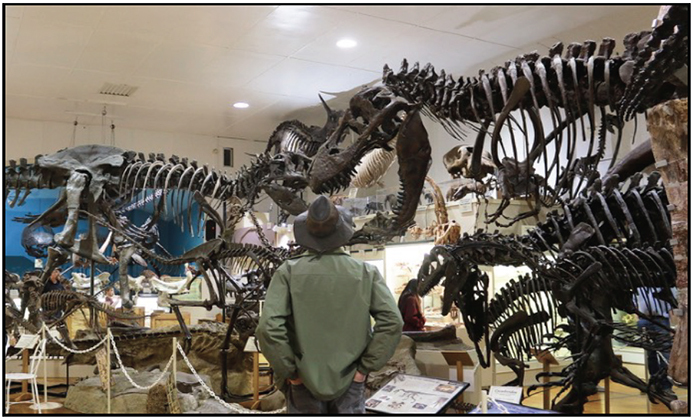 "Bones: Then and Now" and "Mountain Building"
02.03.19: MIKE BALDWIN: At the February adult membership meeting Jane Coop gave the adults a brief history of dinosuar discoveries and talked about the adventurous aspects of bone-hunting. While the adults' program was underway, the youth talked about mountain-building processes and did an graham cracker/marshmallow creme edible mountain-building experiment. Read more in the February issue of Rockhound News. "Parkin Site Research" and "The Colors of Mars"
01.03.19: MATTHEW LYBANON: Since the 1960s, the Parkin site has been a treasure of knowledge for archeologists. 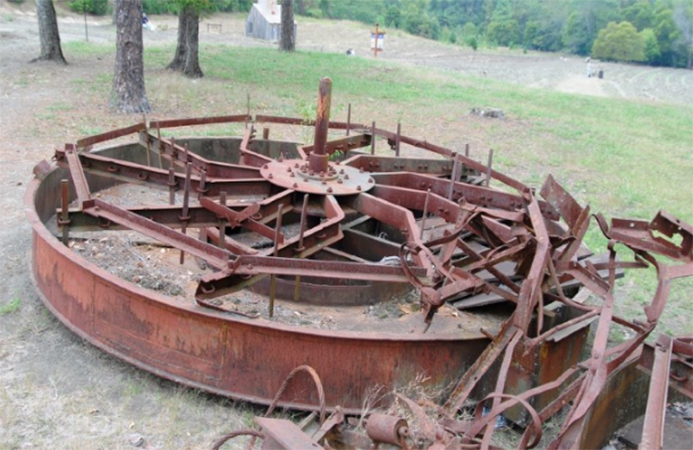 Located in Cross County, Arkansas, it features one of the best preserved Mississippian Period occupation sites in all of Arkansas. We learned more about Parkin during the January adult program. During the January MAGS youth meeting, we took a closer look at the colors of the surface of Mars. The rusty red color that the planet is known for is derived from iron oxide, like the rust color you might see as iron oxidizes on Earth. Read more in the January Rockhound News. 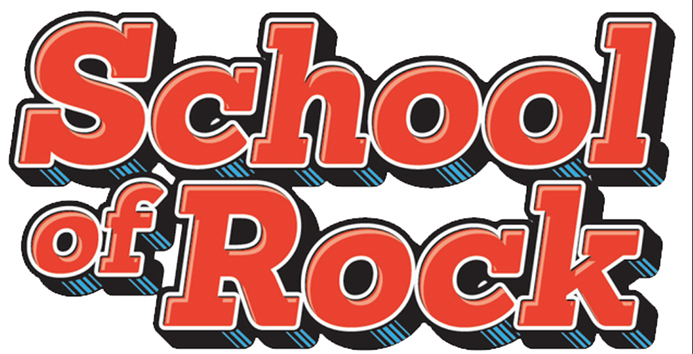 11.04.18: MIKE BALDWIN: Join MAGS for the November School of Rock. The program will include table displays and information on  rock tumbling,  crystal cleaning,  rock drilling,  jewelry making,  wire wrapping,  coppersmithing,  metal detecting,  Indian artifacts,  geode cracking,  fluorescent minerals,  rock types and the rock cycle, and  a silent and exuberant-yelling auction. Read more in the November Rockhound News. 10.01.18: DAVE CLARKE, MAGS MEMBER: What do we know about prehistoric life preserved in amber from the time of the dinosaurs? Has blood really been extracted from a fossilized insect like we saw in Jurassic Park? 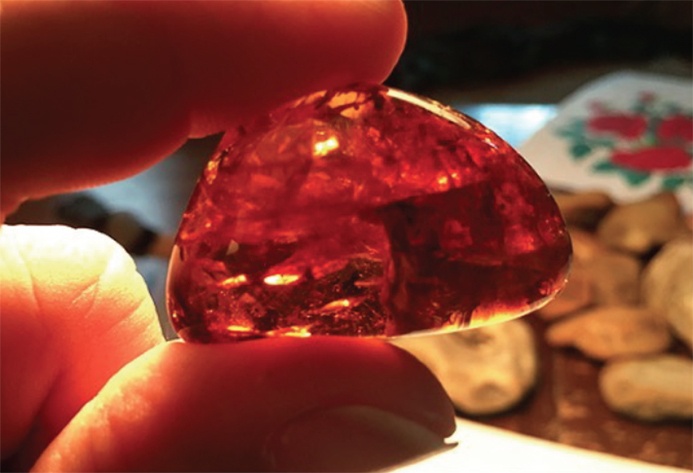 Is amber a mineral or gemstone, or is it a fossil? Read more in the October Rockhound News and hear Dave's amber presentation in person at the October MAGS meeting. 09.05.18: DR. NINA L. BAGHAI-RIDING: The late Pleistocene of North America is characterized by vertebrate animals (mostly mammals weighing ≥ 44 kg) including American mastodon, bison, giant ground sloth, and giant short-faced bear. Read more in the September issue of Rockhound News. 08.03.18: MIKE BALDWIN: The August MAGS field trip to Discovery Park, Union City, Tennessee was great. If you have never been, you should go. If you have been, you should go again. Sherri and I went on the 2014 field trip to the park and it was awesome. The park is approximately 2 hours and 15 minutes from Memphis. Park opens at 10:00. Prices are: 3 and under Free; $11.95 for 4-12 years old; $14.95 for 13-64 years old; $12.95 for 65+. Read more in the August issue of Rockhound News. 07.04.18: MATTHEW LYBANON: In August and September of 2017 Hisami and Jimmy McNeil went to South Africa, Namibia, and Botswana to buy minerals. 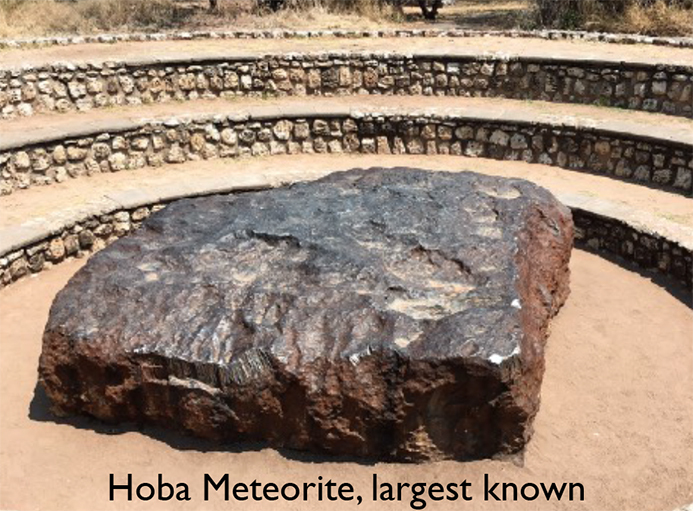 Traveling around 5,000 miles with a South African mineral dealer friend they visited local mineral collectors, dealers, and miners; they visited the locations of several world famous mines.. Read more in the July issue of Rockhound News. 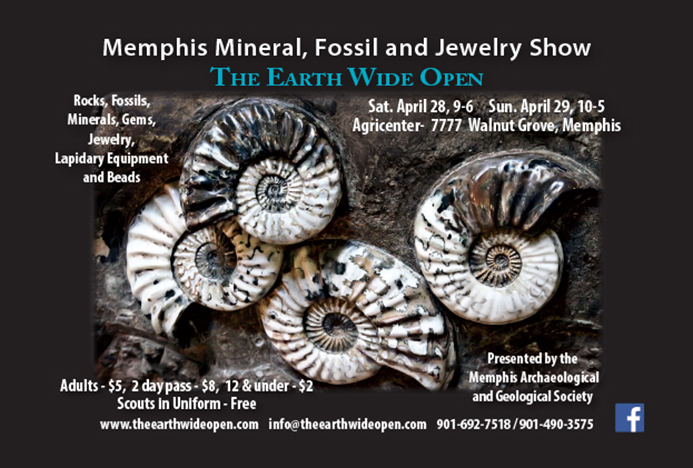 04.01.18: MIKE BALDWIN: Visit the official website for the Memphis Mineral, Fossil, and Jewelry Show. The Show, which for one weekend a year, offers everyone the opportunity to experience the EARTH WIDE OPEN. 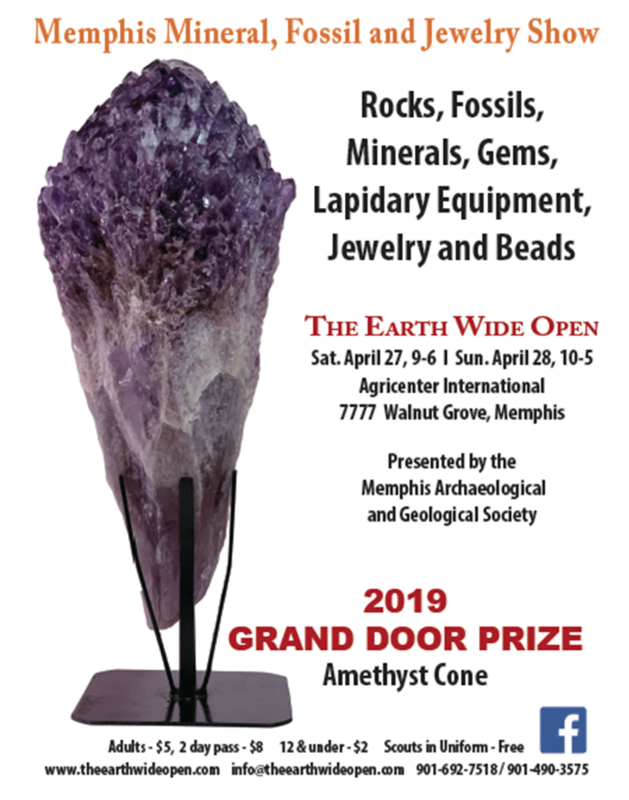 Where else can you go and find a one-stop-shop for dioptase, dinosaurs, and diamonds for a whole weekend right here in Memphis? There is just no better way to complete your Earth Day celebration than to see what’s inside! All Scouts-in-uniform (Boy Scouts, Girl Scouts, and Scout Leaders) get in free! Click here and learn more about The Earth Wide Open. Check out the April Rockhound News. The 50mm-wide specimen represented here is Dalmanites retusus. Known only from isolated pygidia. The pygidium is distinct from other Birdsong trilobites in that it has a rounded profile and lacks a pygidial spine. Excerpt from Devonian Fossils of West Tennessee, by Kieran Davis. The Lower Devonian system is well represented in Tennessee, forming part of an almost unbroken sequence of deposits ranging in age from the Middle Silurian to upper Lower Devonian. 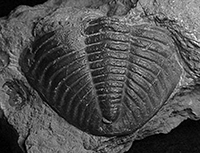 The Ross Formation of west-central Tennessee contains the most diverse and abundant Lower Devonian invertebrate fauna and this guide focuses on the most fossiliferous member of the Ross--the Birdsong Shale. The Birdsong Shale is well exposed in road cuts along State Highway 69 and in the many active and disused quarries of western Tennessee. 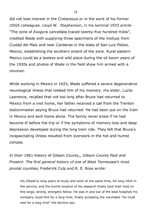 Click here or on the trilobite to download your copy of this 40-page PDF. Excerpt from Late Pleistocene Megafauna, by Dr. Nina L. Baghai-Riding, Danielle B. Husley, Christine Beck, and Eric Blackwell. The late Pleistocene of North America is characterized by vertabrate animals (mostly mammals weighing ≥ 44kg) including Mammut americanum (American mastodon), Bison spp. 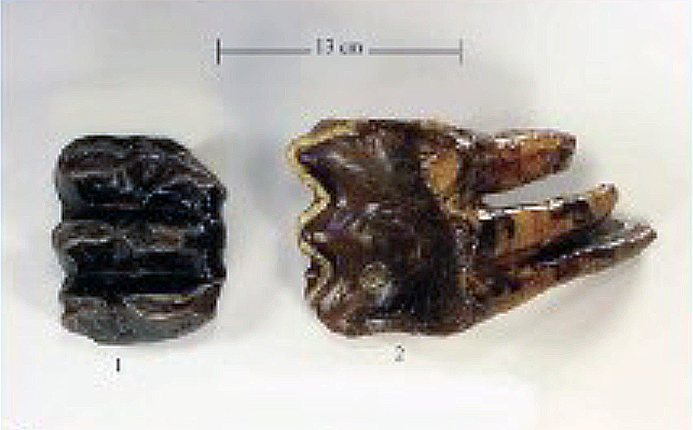 (bison), Megalonyx jeffersonii, and Arctodus simus. Disarticulated skeletal elements of vertebrate fauna are frequently exposed on floodplain and gravel bar deposits after floodwaters retreat throughout the Mississippi Alluvial Plain. 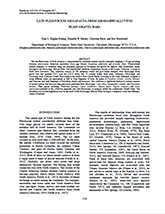 Click here or on the lefthand image to download your copy of this 24-page PDF. For information about The Earth Wide Open, the annual Rock Show sponsored by MAGS and held at the AgriCenter in Memphis, TN, click here. Click here to visit, ask questions, or leave comments on the MAGS Field Guide to Rocks, Minerals and Fossils. Click here for an index of topics on the blog. CHUCALISSA (Choctaw word meaning "Abandoned House"): The ruins of this native American town sit on the Mississippi bluff five miles south of downtown Memphis. At one time the population of Chucalissa could have been a thousand to fifteen hundred. The town existed into the seventeenth century, when its townspeople left and never returned. Hence, the name Chucalissa. Since most native Americans north of the Rio Grande never developed a written language, we can never know the town's real name. 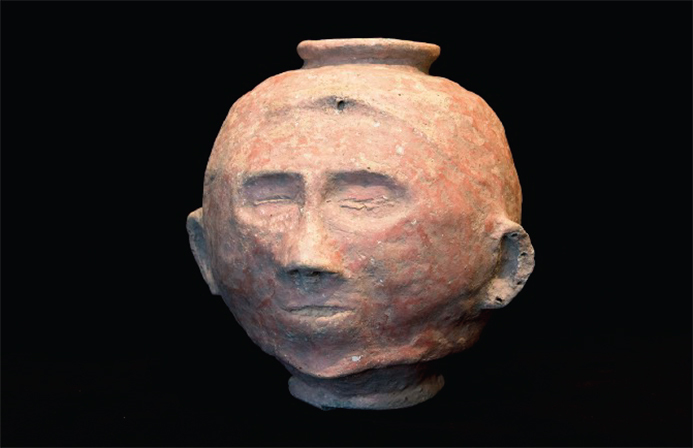 Read about MAGS' involvement in the early years of Chucalissa. MAGS MEMBERS: We now have a place to showcase your field trip, rock show, and mineral-collecting vacation pictures. 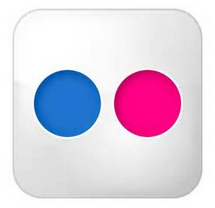 Visit our Flickr gallery of pictures. If you have pictures you would like to share, send them to the MAGS webmaster and [if they are pictures all members of MAGS would enjoy] he will get them in the gallery. 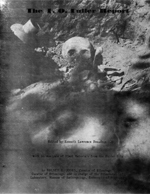 "When out fossil hunting, it is very easy to forget that rather than telling you how the creatures lived, the remains you find indicate only where they became fossilized." 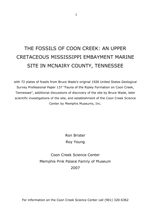 © 1998-2019 Memphis Archaeological and Geological Society. This page last updated 04.02.2019.